Really, what is better than a fresh gooey chocolate chip cookie straight out of the oven? Air conditioning? Well, yes. 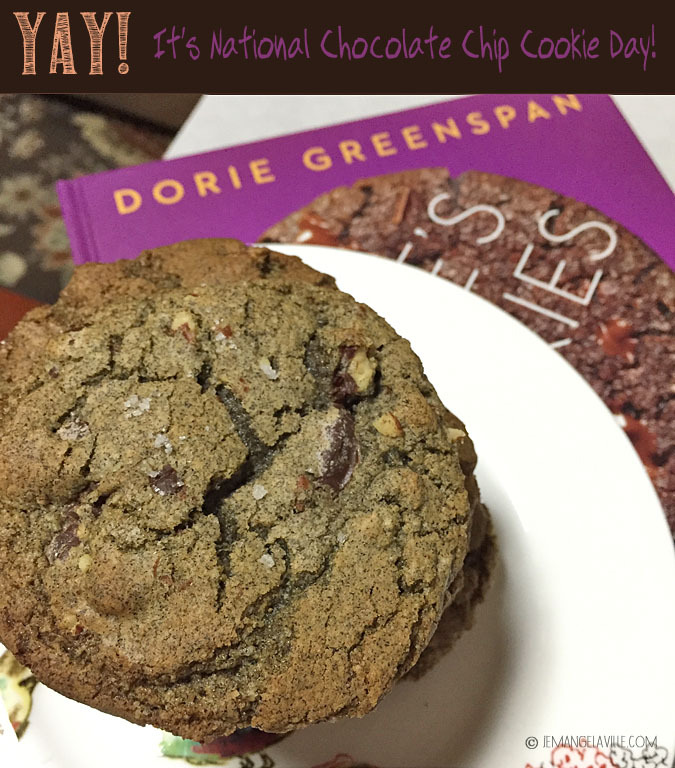 But…it’s not the chocolate chip cookie’s fault that August 4th is National Chocolate Chip Cookie Day! Do not blame the cookie if the weather is too hot to even think about turning on the oven. 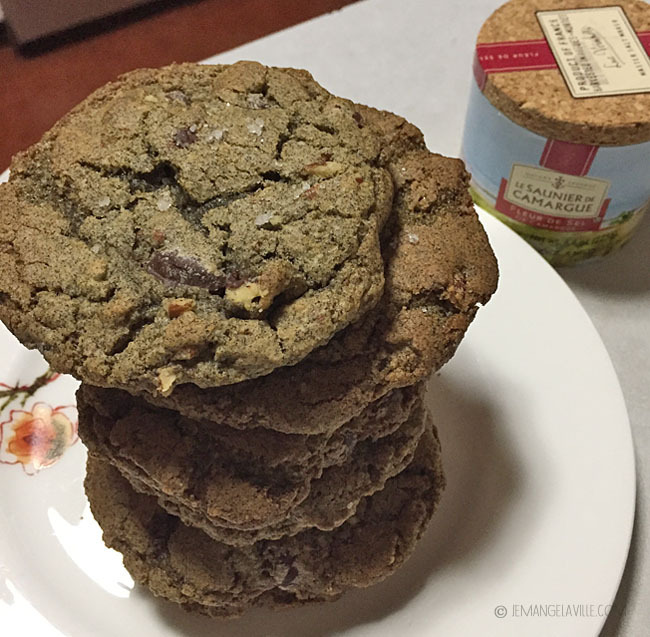 That said, and as I write this on the 3rd, we’re about to break records for the hottest day ever on Earth in the Pacific Northwest (108 degrees F in Portland), so let’s think back to a cooler time–gentler time when I opened up my copy of Dorie’s Cookies and found this amazing and alt chocolate chip cookie recipe. Buckwheat flour! Whole wheat flour! A sprinkle of fleur de sel on top! They are healthy! Kind of…for cookies. In this version, I also added vanilla and I upped the nuts, as one tends to do if the occasion calls for it. So, if you can safely turn on your oven, you might want to celebrate August 3rd by baking a batch of these wonderful and interesting chocolate chip cookies. Spoiler: The cookie dough needs to chill in the refrigerator for at least an hour, so plan accordingly. Adapted from a recipe in Dorie’s Cookies by Dorie Greenspan, makes about a dozen large cookies, more depending on your scoop size. If you do use a smaller scoop, you will probably get about 2 dozen cookies. Whisk together all three flours, the baking powder, and baking soda. Working with a stand mixer fitted with the paddle attachment, (or in a large bowl with a hand mixer), beat together the butter, both sugars, and the salt on medium speed for 5 minutes, scraping down the sides and bottom of the bowl a couple of times. Add the egg and beat for about 1 minute, then add the yolk and the vanilla extract, beat for 1 minute more. Turn the mixer off, add the dry ingredients all at once and pulse the mixer a few times to start blending them in. Working on low speed, mix only until most but not all of the dry ingredients are incorporatedâ€”you should still see streaks of flour. Add the nuts and the chocolate, pulse and then, if necessary, mix on low just until everything is blended. 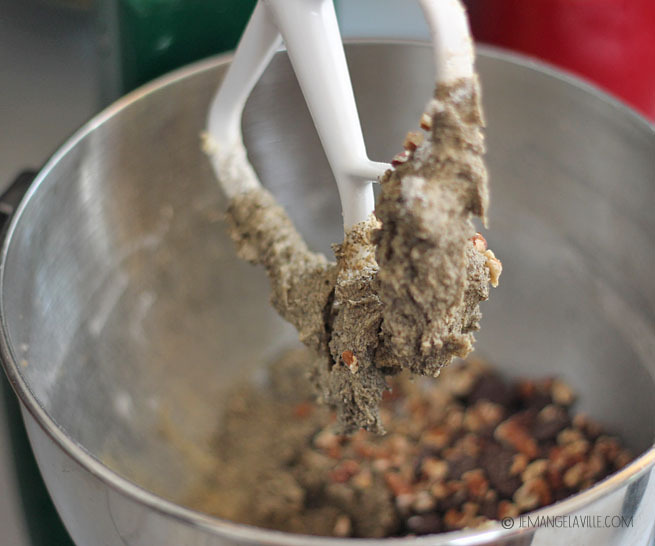 Or do this last bit of mixing by hand, with a sturdy flexible spatula. If you’re dough looks a little moister than normal cookie recipes, don’t worry, you’re going to refrigerate it a bit. When you’re ready to bake, center a rack in the oven and preheat it to 375 degrees F. Line a baking sheet with parchment paper or a silicone baking mat. Remove the dough from the fridge. Using a medium cookie scoop, scoop out level portions of dough. Place the mounds of dough about 2 inches apart on the baking sheet. Sprinkle each mound with flake salt, making sure not to concentrate the salt only on the very center of the cookie. Get it out on the edges too! Bake for 8 to 10 minutes, rotating the sheet at the midway mark, or just until the edges of the cookies start to brown. The cookies will look a tad underbaked, and thatâ€™s the way they should be. Transfer the baking sheet to a rack and let the cookies rest for about 2 minutes, then, working very carefully with a wide metal spatula, transfer the cookies to a rack to cool until they are just warm (delicious) or they reach room temperature. The cookies will firm as they cool. Repeat with the remaining dough, making certain that you always start with a cool baking sheet. a half-recipe on a warm summer day is both sensible and delightful!